Electro-Cap Center B.V. is authorized dealer of MediFactory's BrainWave cap. The BrainWave cap is specially designed for improving your lab results significantly in a fast and affordable manner. * Ask for special gel formula to reduce impedances in seconds after applying gel. - Unshielded cables have a 25 or 37Pole Sub-D connector and are compatible with most EEG systems when using standard Electrode Board Adapter cable. Determine the required cap size by measuring the head circumference and look at the size chart (below) to see what size BrainWave cap you require. In situations of 64 or more electrodes you should consider the use of caps with intermediate sizes (M-L, S-M, S-X-S). This will improve the patient comfort and extend the functional life-span of your cap! X- small caps will fit most children from 8-9 months up to 2 years, Small caps will fit children from 2 years up to 5 years, Medium-Large caps will fit most patients of 5 years and older. Adult caps have a pair of colored soft Velcro straps that will hold the cap secure and comfortably under the chin. Adult caps can have a maximum of approx. 256 electrodes on a large cap. Any other layout or electrode quantity is on request possible. Infant cap sizes start from Newborns up to approximately 5 years. Neonate Caps have textile straps from same fabric as cap at each side of head. These straps can be used to make a loose knot to keep cap at its place. To optimize the fit, elastic straps are incorporated in the front and back to adjust the size. If required, Neonate caps can be supplied with openings at position Fp1 and Fp2 instead of these electrodes. These slots can be used for IV- lines, sensor cables or other leads needed. All above mentioned sizes / age indications are for reference only. The head size should always be measured before applying any cap. All electrodes are made of sintered silver/silver-chlorinated (Ag/AgCl) grains that ensures a DC stable recording even over long time of recording. Sintered electrodes never need to be re-chlorinated and last longer then any other type of electrode material. Depending on cap size a maximum of 256 electrodes can be placed, see the BrainWave cap size chart for more details. Standard cable length is 1,8 metres, measured from the neck, other lengths are available on request. Caps with unshielded cables can have a maximum of 37 electrodes per connector and 34 electrodes for shielded leads. The maximum number of electrodes is determined by the size of a cap. In the BrainWave size chart you can see the maximum amount of electrodes per cap size. In the exceptional event of a faulty electrode, we supply separate “plug-in” electrode cables to do a quick repair. All caps are serviceable and repaired caps are returned to customer within 5 working days after receipt. BrainWave caps can also be supplied as customized caps with different layouts, connectors etc. Send your requirements to info[at]electrocap.nl and we will contact you to discuss the possibilities. Contact Eletro-Cap Center B.V. for detailed overview of electrode layouts. 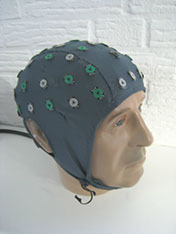 BrainWave caps are connected to an EEG system by using one or more EBA cable’s (depending on number of electrodes in cap). This will enable you to prepare the patient away from the EEG system and hook-up the cap to the system within seconds. All leads of an EBA have are 30cm long and have individual numbers for easy identification and fast hookup to any EEG head box. On request we can provide EBA’s with longer leads and electrode positions printed instead of numbers. Unshielded EBA’s have Touch Proof (DIN style) plugs that fit in any EEG head box. Shielded EBA’s have Micro coax plugs that fit to EEG systems with coaxial connections. Contact Electro-Cap Center B.V. to check if your system is compatible to our shielded BrainWave cap.